I can't guarantee you a winning result in this Monday's game between the AFC East rival Patriots and Dolphins, but I can promise you it won't look anything like last Monday's wildly brutal & dirty Steelers-Bengals bloodfest. Wow, was that game something. This writer was 2-0 on that Pittsburgh 23-20 comeback win, taking the Bengals +5.5 and the under 43.5. This week's game looks like one of the bigger mismatches on the 2017 Monday night schedule. The Patriots have won the AFC East every year since 2003 other than 2008, the year Tom Brady went down with a Week 1 season-ending knee injury against the Chiefs. The Pats have a magic number of 1 to add another division title, although at this point I doubt the team even celebrates those. If Buffalo loses at home to Indianapolis on Sunday, which is possible if injured Bills quarterback Tyrod Taylor has to sit out, the Pats clinch. Or New England (10-2) can simply do so on the field Monday. Clearly, this team has more important goals on its mind, the first grabbing home-field advantage throughout the AFC playoffs. That could happen as soon as next Sunday in Pittsburgh (10-2) depending on what the Steelers and Pats do this week and then that result. There's almost no way that New England slips lower than No. 2 so we are probably looking at another Steelers-Patriots AFC title game regardless. Miami (5-7) hasn't been officially eliminated from the playoffs yet but would have to win out and get a ton of help. The former isn't happening because I don't think the Fins win this game, much less Week 15 in Buffalo or Week 16 in Kansas City. They close at home vs. Buffalo. The biggest spread in the NFL this season was New England at -17 vs. these Dolphins two weeks ago in Foxboro. I'll always take that many points, but the Pats did just cover in a 35-17 victory. Brady threw four touchdown passes, two to Rob Gronkowski. Dion Lewis rushed for 112 yards and Rex Burkhead rushed for a score and caught one. The Dolphins were held to 221 total yards and turned it over three times with backup QB Matt Moore under center. Jay Cutler was out then due to concussion. You won't see Gronk on Monday nor most likely Moore. Gronkowski was suspended one game for his ridiculous cheap shot on defenseless Bills cornerback Tre'Davious White in last week's 23-3 win. There was simply no excuse for what Gronk did, and he got off light. I believe that if he wasn't such a big star and if the Patriots didn't have such a highly-anticipated game next week that Gronk gets two games. The suspension will cost Gronk $281K in salary but potentially much more in season-long incentives since that's one fewer game he plays. He also missed New England's 19-14 win in Tampa in Week 5 due to injury. It's a major loss, but the Patriots are about the most interchangeable team in the NFL outside of at quarterback. Brady, incidentally, has now won 55 games in December, the most by a starting QB in any calendar month in league history. He also joined the 65,000-yard club last week, ranking fourth all-time. The Fins won't miss Gronk as they have allowed some big days to tight ends this season on top of Gronk's two weeks ago. He has scored five touchdowns in his past five games against Miami. The Patriots are 20-5 in games without Gronk, including 9-0 since the start of the 2016 season. Meanwhile, Moore won't play unless Cutler stinks or gets hurt - although both options are quite possible when talking about Cutler. He returned from his one-game injury absence and was OK in a 35-9 win over the Broncos last Sunday in completing 18 of 31 for 235 yards, two TDs and two picks. Kenyan Drake rushed for 120 yards and only Miami's second score on the ground all season. But the defense was the real story in getting two safeties for the first time in franchise history and Xavien Howard returning a pick 30 yards for a touchdown. Don't get too excited about that dominant performance, Fins fans. The Broncos might be the second-worst team in the NFL right now after the Browns - and I'd call that game a pick'em if it was in Cleveland. 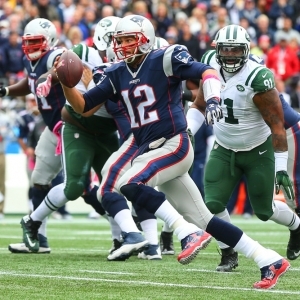 At 5Dimes , New England is as 12.5-point favorite (+105) with a total of 47. On the moneyline, the Patriots are -550 and Dolphins +425. On the alternate lines, the Pats are -11.5 (-105), -11 (-110) and -10.5 (-117). New England is 8-4 against the spread (5-1 on road) and 6-6 "over/under" (2-4 on road). Miami is 4-6-2 ATS (2-2-2 at home) and 7-5 O/U (4-2 at home). The Patriots are 10-1 ATS in their past 11 vs. teams with a losing record. They are 6-2-1 ATS in their previous nine on Monday night. However, New England has covered only two of its past eight on the road vs. teams with a losing home record. Miami is 1-5 ATS in its past six vs. teams with a winning record and 0-8 ATS in its past eight on Monday. The over is 8-1 in the Dolphins' past nine vs. the AFC East. The home team is 10-1 ATS in the past 11 meetings. The over is 5-2 in the previous seven. This is only the second time in Patriots history it plays the same foe twice in three regular-season weeks. It last happened in 2000 when the Colts were still division foes. New England catches a weather break here as a cold front is to hit Florida over the weekend and temperatures at kickoff are expected to be only in the high 50s in Miami. Even this time of year, it can still be in the 80s and humid in Miami. It was this week in fact. I do think the Pats will be looking ahead a bit and will miss Gronk some. Plus, they had lost three straight in South Florida before last year's win there. The Patriots are only 16-36 all-time in Miami, including two postseason games. I'm not expecting a Miami victory, but it should be able to lose by no more than 10. It's the first time since 2007 that the Patriots are double-digit favorites in Miami. Take the points and go over. Doc's Sports is offering new clients free NFL picks from any handicapper on our Expert Handicapper list. This special offer does not require a credit card, and you will never have to deal with a salesman. Click here to get your free $60 NFL picks credit today . Get free NFL betting picks weekly on Doc's Sports free football picks page .